Bobby Horton's Melody Blog: The Bonebrake Syncopators "That Da Da Strain"
The Bonebrake Syncopators "That Da Da Strain"
Fred "Virgil" Turgis' Jim Flora-inspired cover for the debut CD by LA's the Bonebrake Syncopators is the perfect gateway to the music waiting inside. The combo features the unique combination of vibes (DJ Bonebrake), steel guitar (Jeremy 'JW' Wakefield), and guitar (TK Smith), anchored down by Dave Stuckey on drums (and vocals!) and Wally Hersom on bass. There's a nice mix of instrumentals and vocal numbers. The vocals are handled by JW ("Porter's Love Song", "Three Little Words") and Stuckey ("Baby Won't You Please Come Home", "China Boy", "Limehouse Blues") with the balance of the songs showcasing the instrumental talents of TK, DJ, and JW. One of the standout instrumental moments occurs about three and half minutes into "Sequence In Bb" when DJ Bonebrake launches into what can only be described as "mallet madness". He is a truly gifted percussionist as evidenced in this recording. The arrangements are tight throughout the recording; oft-times employing all three soloists to play intricate lines together. 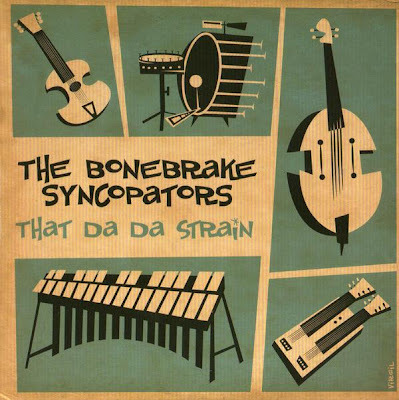 The Bonebrake Syncopators don't tour so be sure to pick up this CD by clicking here or drop by one of their shows when you're in the LA area. Nat King Cole "Calypso Blues"